The World Chess Championship is being held now in Mexico City. It began on September 12, and is scheduled to finish on September 30. Unlike some of the World Championships of the past, this one is a tournament between eight players rather than a match between two. The eight players are Vladimir Kramnik (the current world champion), Viswanathan Anand (the world’s highest rated player), Levon Aronian, Alexander Morozevich, Peter Leko, Boris Gelfand, Peter Svidler and Alexander Grischuk. 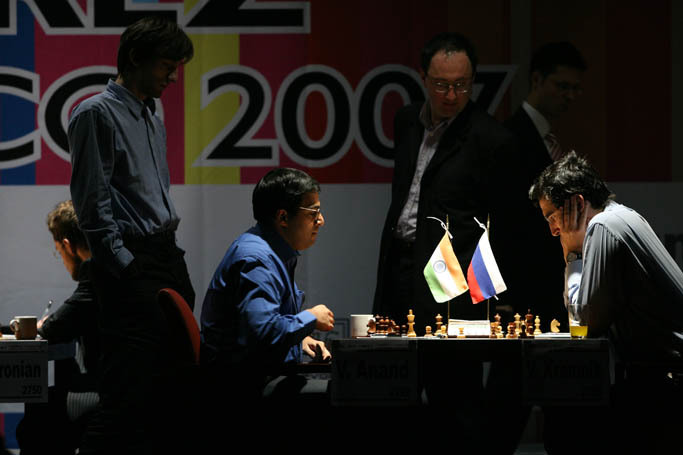 In the picture above Kramnik (to the right) is playing Anand (to the left), while Gelfand (between the players) and Grischuk (behind Anand) observe. All of these players play at a fantastically high level (the general level of human chess players has steadily improved with time), but sadly fewer people pay attention now that computers play even better. The only one of these grandmasters that I’ve personally played against is Peter Svidler, in the 1995 New York Open. I was doing very well in that tournament, and had a chance to win a large prize, but then I played Svidler with the Black pieces, and he crushed me. The memory is actually not so bad, because it was very interesting to play him and to talk to him afterwards (he was 19, but it was already clear that he could potentially challenge for the world championship), and I nevertheless achieved a norm for my international master title in that tournament. The World Championship tournament is a double-round robin, so it will last 14 rounds. After nine rounds, Anand leads with a record of 6-3, followed by Gelfand with 5-4, Leko, Grischuk, and Kramnik with 4.5-4.5, Aronian and Morozevich with 4-5, and Svidler with 3.5-5.5. Today Kramnik plays Anand with the White pieces; he’ll need to win to have much chance of catching him. But even if Kramnik does not win, he’s guaranteed a match against the world champion in 2008. To learn more about the tournament, you might start with Macauley’s rather artistic coverage of the first game between Kramnik and Anand in round 3. More videos of this type head are at macauley.blip.tv. You might also head over to the excellent chess web-site The Week in Chess for news and annotated game scores, and the ChessVibes blog for many on-the-scene videos (often including instructive post-game interviews with the players) and the games in an easy-to-use Java player (I already pointed to some remarkable videos from earlier this year at ChessVibes in a previous post.) But perhaps the most interesting coverage of the World Championship tournament for intermediate or stronger chess players is by the Internet Chess Club, which has a team of strong grandmasters presenting annotated game videos. This entry was posted on September 24, 2007 at 12:01 am and is filed under Chess, Video. You can follow any responses to this entry through the RSS 2.0 feed. You can leave a response, or trackback from your own site. Kramnik was 2nd and Gelfand 3rd because of NS.